There are times when a 3 block long fireplace fits a house and times when a single block looks better or saves room. Regular fires can also be a hazard for wooden houses. The fireplace block has the fire, logs, sides, and smoke compressed into a one block space. Add a few chimney blocks and watch the smoke puff out. Firepits and firerings can be used as an outdoor alternative. Create grills and prepare cooked food. Swipe your flint and steel at your favorite block and enjoy the fire! -Fireplace Block: that can be lit by right clicking with flint and steel or extinguished by punching. -Stove Block: A different style of fireplace block. 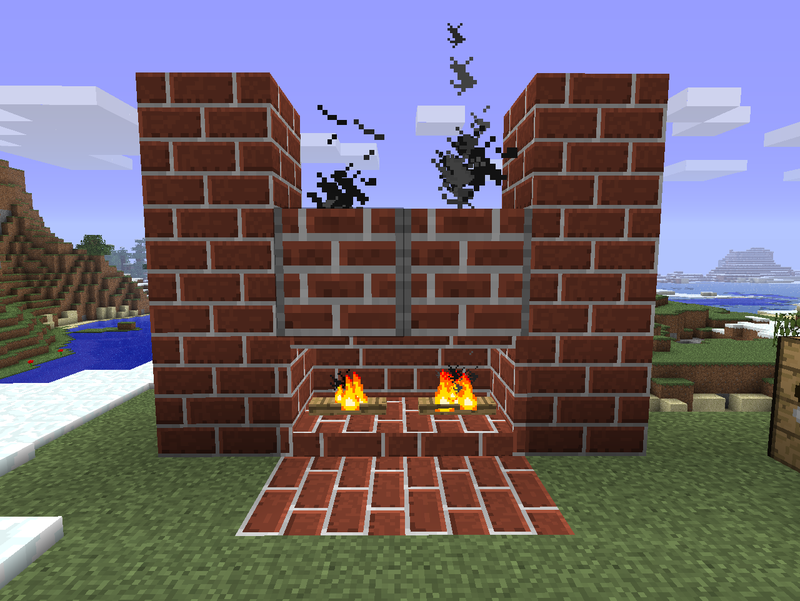 -Chimney Block: that creates smoke puffs (as long as it starts right above the fireplace and continues upwards undisturbed or gets powered by redstone). -Firepit Block: good for contained campfires. -Fire Ring Block: A tiny, round, variant of the firepit. -Grill Block: You can grill food items on it. Different tiers accompany different materials. A Tier 6 grill is much faster than a Tier 1 grill. -17 Materials: Stone, Brick(Item), Cobblestone, Iron Ingot, Gold Ingot, Diamond, Emerald, Mossy Cobble, Obsidian, Stone Bricks, Mossy Stone Bricks, Cracked Stone Bricks, Netherrack, Lapis Lazuli, Endstone, NetherBricks, Sandstone. -No Fire Spread: you can safely light it inside a wooden house. 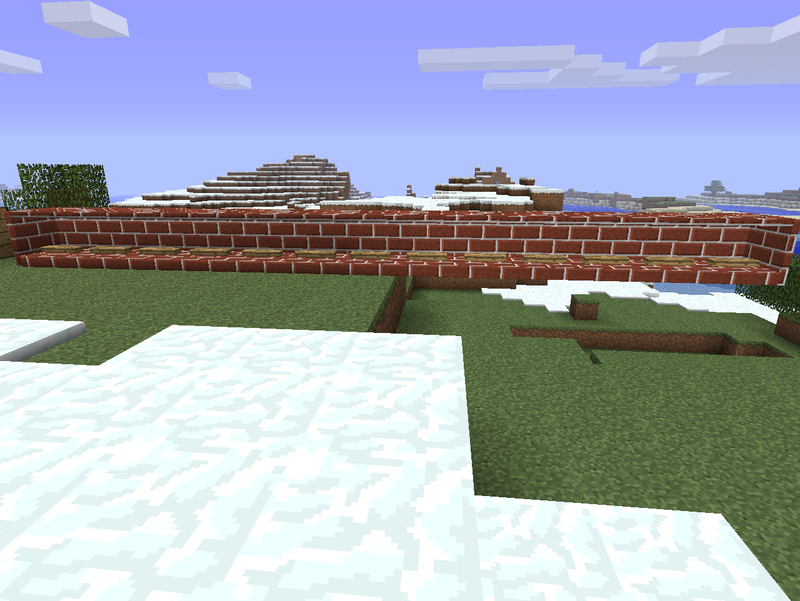 -No terrain indexes are used: Vanilla textures (which will match your texture pack) are always used when possible. Can I use only some materials and block types? Check the config file for BlockSettings and MaterialSettings. Change true to false on any material or block to disable it. All blocks are safe to use inside a wooden house. Do the blocks work with texturepacks? Every texture except for the coal in the grill should match your current texturepack. How do I cook with the grill? Add coal to the grill and light it to start cooking food. Forge Modloader is required to run FireplaceMod. Get the Universal version. -Read Installation if you are new to installing mods. - There will be some strange issues with textures in the grill GUI until I figure out the new texture system. Everything else is functional, so I released this update anyways. - Adjusted the mod for the new texture engine. - Fire charges can also be used to lit blocks now. -Specific blocks and materials can be disabled in the config now. This option was added so users can decrease clutter in their creative window. Disabling a block removes it completely, but disabling a material will not remove it from existing items and blocks. -Added a new texture system for the top of chimneys. The new method uses only black squares that join with adjacent chimney blocks. The new top texture can be disabled in the settings section of the config. -Added a section in the config file for custom Grill recipes. There is an example and explanation there. - Complete re-code of the mod. It may be a little rusty, but it will be fixed over time. - Ported to Forge Modloader. - Grills now take up one block rather than two. - Updated cooking recipes for the grill. - Shift-clicking works with the grill. - I am also porting the server mod of this to forge multiplayer. Non-forge support will be dropped soon. -Hopefully fixed the grill crash (again). -Rewrote the grill drop function. This might fix the dual drop crash. -New installation method. Check the download page for details. -[1.1 port] Expanded block ID limit for those who use extended block mods. Use a number below 256 if you don't use one of those mods. -I tried making the mod more resolver friendly. I can't promise full compatibility with id resolvers, though. -New fire effects. You can set "use_old_flames" from the configuration (/config/mod_fireplace.cfg) to 1 if you prefer old effects. -The downloaded zip contains a client and server zips. Use the client zip for singleplayer. -You can download a Forge or a Normal version of the mod. Forge version uses no Terrain indexes but is incompatible with HD (Default textures appear on fireplace mod blocks). -Minecraft Forge is now used to handle terrain indexes (Thanks to MatrexsVigil for assistance). -Fixed stone chimneys crashing when dropped. -Grill's coal layer only appears if the grill has coal inside. -Drop the FireplaceMod zip directly in ".minecraft/mods" to install. Make sure you remove the old version next update. -Fixed Brick Grill's label from "Stone Brick Grill" to "Brick Grill". -Redstone power causes chimneys to smoke now. This can be turned off by setting the enable_RedstoneChimney if the config to 0. -Partial SMP Port. Grills are not in the SMP version due to the way the GUI and tier are coded. -Client folder contains PATCHES for the SSP version. Install SSP first. -Water will extinguish different blocks if it flows by open areas such as the sides of the fireplace or the top of the grill. -Fixed lit grills not dropping in certain situations. -Added the firering block. It's similar to the firepit except it has no cover and appears smaller because of low resource cost. -Added enable_infiniteFuel 1 to the config for those who want the old grills. You will still see the coal slot but the fuel meter will be constantly maxed. -Removed support for converting old configs. -Added tiers to the grill (Lowest is slowest). -Cook time for the grill has increased a bit. -Fixed the texture bug where placing a block to the side of the grill would make that side of the grill invisible. -Added a new config value to disable the net on firepits. "enable_firepit_cover=0" will disable it. 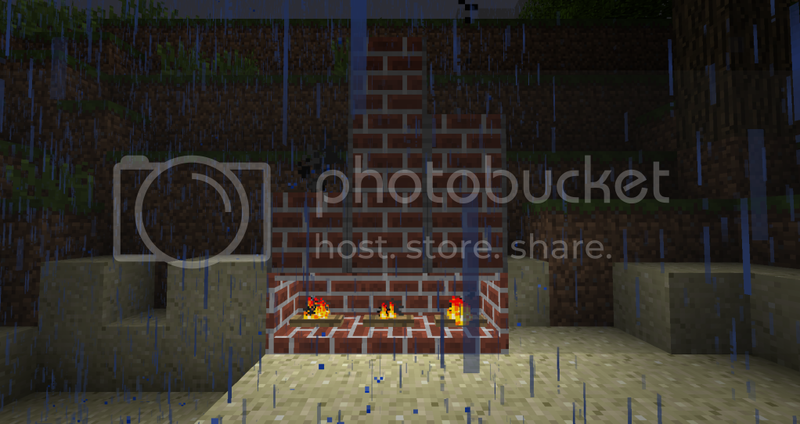 Due to a new metadata system, old fireplaces will turn into a brick, cobblestone, moss stone, or obsidian fireplace. If you want your old brick or cobblestone fireplace back, you can break them and inventory edit their damage values to 0 for brick or 1 for cobblestone. -I have completely rewrote the mod and how it works. -An entire spectrum of materials to choose from! -Fireplaces merge with other fireplaces besides the ones to the side. -If there is a block behind a fireplace, it creates a wall inside the fireplace. -Added the firepit. Now you can sit around it at night with that creeper right behind you! -Implemented a better configuration system. Your old configurations will be converted over. -Removed the item ids and ugly icons. The blocks display correctly in the inventory. -Fixed the bug where at a certain height the Chimney wouldn't appear unless a block was next to it. I didn't test the fireplace for this but I applied the fix to it anyways. -Requested twice from people using Fancy Pack: setting the CHIMNEY BLOCK ID to -1 will disable the block. WARNING: Backup your map before you do this! -The Stone borders were removed this update. 2) Visit the download page to get the mod zip file. 3) Drag the downloaded FireplaceMod.zip into the ".minecraft/mods" folder. 2) Post the error log that shows up on minecraft or the contents of your .minecraft/ModLoader.txt file. -Is there a bug in the mod? I can't find out if you don't tell me! Give me some detail and if its a visual bug include a screenshot. -If you have any requests or improvements, tell me and I will try out some of them. -Use mods at your own risk and always backup your maps and jars! Looks cool but can you make bigger like if I wanted a 2x3 fireplace? This is really cool. Notch should add this in 1.7. Great job! I have a few suggestions for blocks. * bay windows- i try to make them in vanilla but it just looks strange. * fence gate- doors are too tall. * pillars- because fences are too thine and blocks are too thick. hope i gave you some ideas to add to your mod. The first screenshot of adjacent fireplaces! It only works for the direction its in right now. im the only man who can put M&M's in alphabetical order. Why fight to live, if living to die? Awesome Update! Here is two images. Also; I Dont know if its possible but; For the Chimney block: Is it possible to use the brick texture from the users pack and Have it some how Have an overlap of your images? (Black top bit + Bits on side)? This would make it suit pretty much everypack! I might try out the limit to joined fireplaces. Perhaps if the line continues right for longer then 6 blocks it forces a split. If I have time when reading a request for a texture pack, I will create a modified fireplace texture and put a link next to the original texture pack's link. Unfortunately the damage value is already taken by the direction. If I did a change to the code to read certain digits for certain data I probably could get it back down into two blocks and an item. i see what your saying, as im not a GOOD coder it must be difficult. maybe you could add corner fireplaces? btw sorry if it feels like im just throwing suggestions at you, its just i haven't seen such a a simple and cool mod that probable should be in game. I say you make it so that you can curve your chimneys to the side in case you have an object above it. you are really making this mod better and need to think up more ideas! That is.. AWESOME! Man, this mod is great, so great, that I made it my first Mod Showcase on my YT channel, which by the way, I will link you in PM when it is done rendering and uploading.